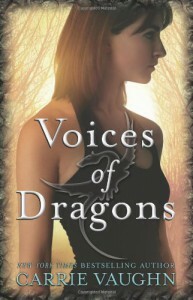 I found Voices of Dragons to be heavy-handed: about the war, about Kay’s best friend pressuring her to get a boyfriend and get laid, about the friendship between Kay and the dragon, Artegal. It tries so hard, but never quite pulls it off. The escalation of the conflict and changing public support was well done, but the military men behind it are charicatures and the politics and political figures behind them are never seen or explored. It’s refreshing and realistic that a straight, sexually active teenage girl would put pressure on another straight girl to become sexually active and Kay’s hesitant, nervous, and thoughtful approach to a relationship fits, but her thinking on sexual contact beyond kissing is unexpectedly flat and simplistic. In her other major relationship, it takes such great pains to give Kay and Artegal similar motivation and to emphasis the ways in which they are alike that it neglects to give Artegal a distinct personality. The strongest part of the book is definitely the middle; the beginning is slow and the ending resolves almost nothing—without being a clear lead-in to a sequel—but the middle of the book contains a powerful and compelling portrait of grief. Unfortunately, it’s not enough to rescue Voices of Dragons from mediocrity.